A few weeks ago I decided to expand my social circle in an environment I have no familiarity with: at a networking party – in New Jersey, no less. I researched different groups who would be attending, giving away door prizes, offering jobs, and the like. Although initially excited and intimidated, I wanted to tell people I was a garbage man and incessantly bemoan the complications of maintaining sanitary conditions within developments and communities. Realizing that my successes of initiating new connections and friends would be drastically limited, I resorted to tell people I’m a licensed pharmacist in New Jersey. So while mingling with other professionals, I ended up meeting someone with celiac disease and he was immediately intrigued by my professional background. Once I told him I was an author with Pharm Psych, he told me he has celiac disease and celiac disease awareness month happens to fall in October! So, in dedication to my fellow colleague, I would like to arrange this article in a celiac disease question & answer format to equip pharmacists with information about celiac disease, thereby educating their patients and raising awareness. Celiac disease is an autoimmune response to ingesting gluten – a protein found in wheat, barley, and rye. About 1 in 141 Americans have celiac disease, but over 80% of cases continue undiagnosed. Normally, people without celiac disease are able to ingest gluten; furthermore, after ingesting food, the villi in the small intestine allows for vitamins, minerals, and nutrients to be properly absorbed into the body to ensure proper health and growth. 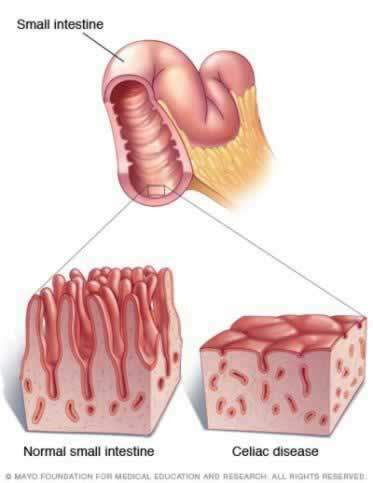 In patients with celiac disease, the main autoimmune target is the patient’s villi; the villi either becomes damaged or atrophied (as depicted to the right), thereby rendering the body unable to absorb nutrients for suitable health and growth. Who is at a greater risk for celiac disease? What are some signs and symptoms of celiac disease? Due to patients developing intestinal gluten intolerance, they may develop an itchy rash full of blisters, otherwise known as dermatitis herpetiformis (as portrayed on the right). Dermatitis herpetiformis is associated with intestinal lining changes within the small intestine. Common rash development sites include the scalp, neck, knees, elbows, and buttocks. Most likely, dermatitis herpetiformis is diagnosed among males more than females and adults more than children. Current treatment includes a gluten-free diet and medications to control the rash. What tests are conducted in order to confirm a proper diagnosis of celiac disease? Blood tests are ordered to determine if there is an autoimmune response to gluten, namely with IgA. If blood test results suggest celiac disease, doctors may perform an endoscopy and perform a biopsy of intestinal mucosa to confirm diagnosing patients with celiac disease. What are some treatment options and lifestyle changes patients with celiac disease can pursue? For patients with nutritional deficiencies, a multi-vitamin is highly recommended to correct vitamin, mineral, or nutrient deficiencies. Additionally, due to intestinal inflammation and damage, intravenous or oral corticosteroids may be prescribed to reduce inflammation. My initial exposure to a gluten-free diet was during one comment during a lecture back in pharmacy school. My professor mentioned that his son was on a gluten-free diet due to his autism, but discontinued the diet due to the lack of improvement in his autistic episodes. “Figures,” I thought – another fad diet like Atkins and eating healthy at Subway thanks to spokesman Jared Fogle. My skepticism only increased as I was visually bombarded with gluten-free products in the nutrition section; I thought people were ludicrous to give themselves over to another fad diet and was anticipating gluten-free products transpiring and becoming obsolete. Even while jointly collaborating with a Registered Dietician when I was with a home infusion company, I can’t remember a single moment when she mentioned a gluten-free diet for a lifestyle change! But when researching on celiac disease and rediscovering the importance of gluten-free dietary products, I’m now grateful for gluten-free products, cookbooks, and supermarket dieticians who can assist patients and caregivers in properly living with celiac disease – as well as the pharmacist who made those delicious gluten-free chocolate cookies during my institutional clinical rotation! With October raising consciousness of patients with celiac disease, let’s continue to consult dieticians and refer our patients to them and buy a cookbook with gluten-free recipes! National Foundation for Celiac Awareness. (2013, October 15). Celiac Disease. National Foundation for Celiac Awareness. Retrieved October 15, 2013, from http://www.celiaccentral.org/Celiac-Disease/21/. Mayo Clinic (2013, May 22). Celiac disease. Mayo Clinic Staff. Retrieved October 15, 2013, from http://www.mayoclinic.com/health/celiac-disease/DS00319. McQuaid K.R. (2013). Chapter 15. Gastrointestinal Disorders. In M.A. Papadakis, S.J. McPhee, M.W. Rabow, T.G. Berger (Eds), CURRENT Medical Diagnosis & Treatment 2014. Retrieved October 15, 2013 from http://www.accessmedicine.com/content.aspx?aID=6395.